The Casa Grande is the centerpiece of Hearst Castle. 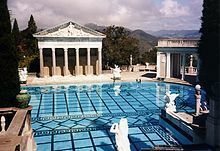 Located in central California along the Pacific Ocean coast, stands Hearst Castle. This architectural wonder, was the home of the famous American newspaper magnate William Randolph Hearst from 1919 to 1947. It is the 10th stop in the series Off The Beaten Path. At one time, christened La Cuesta Encantada or The Enchanted Hill by its famous resident, today it is both a California Historical Landmark and a National Historical Landmark. The later occurring in 1976. It had already joined the National Register of Historic Places in 1972. The grand design for the site although visioned by Hearst himself, would only become reality, by the devices of architect Julia Morgan. Construction on the property continued from 1919 through 1947. Ill health would finally force Hearst to leave the property that year. He would later die in 1951. In 1954, the property would become a California State Park. The site would welcome the first tourists four years later and has remained open since. The Hearst San Simeon State Historical Monument, operates the estate and maintains the extensive collection of antiques and art work, for public viewing. In spite of the isolated location of Hearst Castle, millions of travelers arrive from around the world, on an annual basis. Despite being referred to as simply the ranch by William Randolph Hearst, the main buildings and grounds, are often identified with the surrounding unincorporated areas known as San Simeon. The history of Hearst Castle can be traced back to 1865, when George Hearst purchased some 40,000 acres of land, that comprised Rancho Piedra Blanca. Following the death of his mother Phoebe Hearst in 1919, William Randolph Hearst inherited thousand of acres around San Simeon. 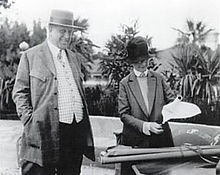 Owner William Randolph Hearst with architect Julia Morgan in 1926. Photograph by Irvin Willat. The younger Hearst grew rather fond of the place over the years, because of the many family camping trips. As an adult, he would choose the undeveloped coastline hilltop, that would later be the site of the castle. The ascent was a simple dirt path, accessible only by foot or horseback, for over 5 miles (8 kilometers). Over time Hearst would buy far more land, until his holdings in the area would encompass near 250,000 acres. What is not well known, was that estate was left unfinished, when Hearst left in 1947. This was the consequence of his persistent design changes. By this time, it already contained 165 rooms. The total square footage of these buildings, exceeds 90,000 square feet (8,300 m2). In entirety, there is 123 acres of gardens, pools, terraces and walkways. These were all built to the specifications of Hearst. The extensive space provided by the immense constructions, allowed Hearst to display an incredible art collection, that had already become legendary. William Randolph Hearst spent a great deal of time and effort, to bring back the best of European architecture. The most notable example of this are the ceilings from the churches and monasteries. These would be disassembled in Europe and later be pieced back together again, in California. Among the American Hollywood and political elite, invitations to the Hearst Castle were highly coveted, during the 1920’s and 1930’s. They would arrive by taking a private Hearst owned train car from Los Angeles, or by availing themselves of the estate’s on site airfield. Actors would include the famous Charlie Chaplin, Clark Gable, Greta Garbo, Joan Crawford, Cary Grant, Bob Hope, Dolores del Rio, the Marx Brothers and James Stewart. The man who was the first to traverse the Atlantic Ocean by airplane in 1927, Charles Lindbergh was also among the guest list. Notable politicians would include American presidents Calvin Coolidge and Franklin Roosevelt and later, even the former British Prime Minister, Winston Churchill. Although guests were expected to attend the formal dinners each evening, they were mostly left to their own devices, throughout the day. Many of them would stay in various dwellings, separate from the main residence and would entertain themselves, while Hearst took care of his business empire. There were always things to do, whether walking through the various gardens and grounds of the estate, or even watching screened films from Hearst’s own movies studio, Cosmopolitan Productions at the on site theater. Commercial filming remains relatively rare at Hearst Castle and most requests made, are simply turned down. Since the estate was donated to the state of California, only two projects have been approved. One was Lady Gaga’s for the music video G.U.Y. The other one Stanley Kubrick’s Spartacus. It was used as the villa, of the historical Roman character Crassus. Although the main estate is a museum, the Hearst family has continued to use an older Victorian house on the property. The dwelling was the home of George Hearst and was constructed in the late 19th century. To permit maximum privacy for the family, from the many tourists who arrive on a daily basis, there is a dense stand of eucalyptus. A condition of the donation of the estate, was that the Hearst family would be allowed access and use of the property, whenever they wished. Patty Hearst a granddaughter of William Randolph Hearst, who made international news following her abduction in 1974, by a left-wing terrorist group, has recalled fondly of time spent as a child at the estate. In one story, she tells how she used to hide behind various statues in the Neptune Pool, while tours were being conducted. Years later in 2001, Patty would host a Travel Channel show on the estate. Amanda Hearst, another member of the illustrious family, is the great granddaughter of William Randolph. She would model for a fashion shoot at the property for a Hearst Corporation magazine, known as Town and Country in 2006. Hearst Castle was known to be the inspiration for the Xanadu Mansion, in the 1941 film Citizen Kane. Orson Welles would play the lead character, in a fictionalized version of the career of William Randolph Hearst. Of course, the castle itself, was not actually used as a location, in the now famous movie. The original Hearst plan for a modest dwelling was soon shelved, as was the initial idea of either a Korean or Japanese theme. Hearst instead settled on Spanish Revival, which was rapidly gaining popularity at the time. 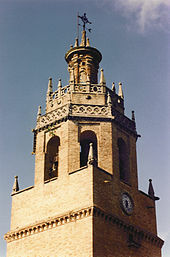 Tower of the Church of Santa María la Mayor, in Ronda, Spain, which served as inspiration for the Hearst Castle towers. He decided to turn to Iberian peninsula for inspiration. The Baroque and Renaissance styled buildings he found in southern Spain, were more in line with his personal taste. He developed a strong affinity for a particular church in Ronda and asked his recently hired architect Julia Morgan, to pattern the Main Building towers after it. He did decide however, to go with a stucco exterior in place of masonry, in respect to Californian architectural traditions. His architect persuaded the magnate to begin with the construction of the guest cottages, because these could be built more quickly. Together these comprise a total of 46 rooms, including the lobbies. There are a variety of historical architectural styles in the various structures, all based on what Hearst himself had seen during his travels around Europe. A prolific collector of art and antiques the construction of Hearst Castle, provided the space necessary to display his vast collection of artifacts. The Castle features a total of 56 bedrooms, 61 bathrooms and 19 sitting rooms. There are indoor and outdoor swimming pools, the most well known being the Neptune Pool. It alone was rebuilt three different times, to finally reach the present state desired by W.R. Hearst. Located near the edge of the hilltop, Neptune Pool offers an distensible view of the mountains,as well as the nearby ocean and the main house. Unfortunately, due to ongoing drought conditions and constant leaks, the main pool is now drained of water. It is in the process to be restored and will soon once again hold 345,000 gallons. It is 104 feet long, 58 feet wide and 10 feet deep at the largest area. The adjoining patio features an ancient Roman temple front. It had been transported from Europe and then reconstructed on its present site. The indoor tiled Roman Pool, is surrounded by eight statues of Roman gods, goddesses and heroes. It is supposed to be styled after the ancient Roman baths, like the famous Baths of Caracalla, built from 211 to 217 CE (Common Era). It holds a total of 205,000 gallons of water. The mosaic tiled patterns, are modeled from what can be seen in the 5th century Mausoleum of Galla Placidia in Ravenna, Italy. The intense colors mainly blue and orange, are fused with gold on the inside. It creates an absolutely spectacular ambiance. 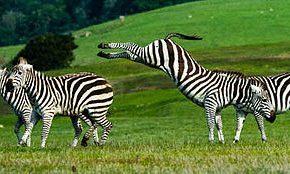 Zebras are a popular attraction on the Hearst ranch. They are descendants from Hearst’s private zoo. Also to be found on the estate are a wine cellar, tennis courts, and the aforementioned movie theater and airfield. 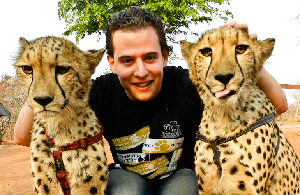 In addition, travelers can find what was once the world’s largest private zoo. Exotic animals including a collection of zebras, still roam the grounds. Morgan devised a gravity-based water delivery system, that transports water from artesian wells on the slopes of Pine Mountain. During the time of Hearst’s occupancy, a private power plant supplied electricity to the estate. This had become necessary, due to the remote location of the Castle. 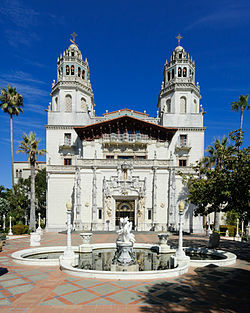 Hearst Castle is located at 750 Hearst Castle Road, San Simeon, California 93452. Hearst Castle is approximately a four hour drive south of San Francisco and a four hour drive north of Los Angeles. One can take a train from the latter to San Luis Obispo and continue the rest of the way to the Visitor Center by public bus. Food and drinks are available at the Visitor Center. There is also a Cafe on site, that serves a variety of food made fresh daily. Travelers coming from the south will arrive via Cambria and Paso Robles. The last indoor tour begins at 3:00 PM. The Bus leaves at 4:00 PM, for the 5 mile trip back to the Visitor Center. Evening Tours will have extended hours. Check this website for details and reservations: http://reservecalifornia.com/ Appointments for a variety of tours, can be made up to 56 days in advance. Most indoor tours are an hour in length. One will then want to spend additional time on the grounds. The Grand Tour is the one recommended by this writer, especially for first time visitors. The evening tour is also available in the spring and autumn, which will take an hour and 40 minutes. 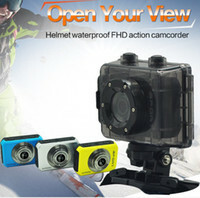 Tourists may also purchase tickets by calling 1-800-444-4445 inside the United States. Outside the country, travelers will need to call 1-518-218-5078, during extended business hours. 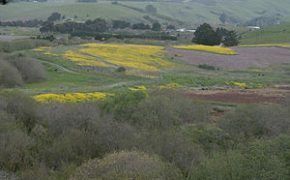 Is available in the nearby community of San Simeon and Ragged Point located four miles away. Thanks for sharing with us your experience.Your topic selection is unique and informative for readers but one thing is sure, the article is well written and of high quality too.